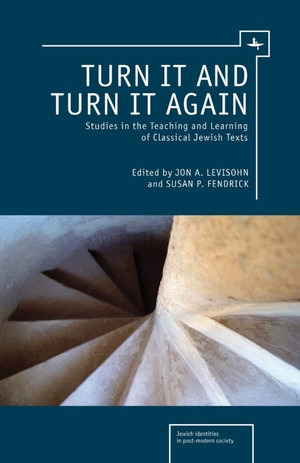 Targum Shlishi helped support the book Turn it and Turn it Again: Studies in the Teaching and Learning of Classical Jewish Texts, edited by Jon A. Levisohn and Susan P. Fendrick (Academic Studies Press). The book was the first publication from the Mandel Center for Studies in Jewish Education at Brandeis. An excerpt from the introduction is reproduced below. The entire book, a valuable resource for teachers of Jewish texts, is open access and available online, with pdfs of each chapter as well as the book as a whole, here. The Jack, Joseph and Morton Mandel Center for Studies in Jewish Education (MCSJE) at Brandeis was founded in 2002 and is dedicated to developing and promoting scholarship on teaching and learning in Jewish education. Jews ask questions about these texts. They pursue their meanings, often celebrating the questions more than the answers, and the process of inquiry more than the product. Texts are transmitted; texts are revered; but most of all, texts are studied. For outsiders to the tradition, this inquiry stances is frequently quite surprising. More than anything else, a fascination with the endlessly intriguing, endlessly surprising work of teaching is the common thread among the contributors to this volume. … They analyze, and they wonder. They do not intend to tell their readers how to teach—although their work will help all of us who teach classical Jewish texts become better and more thoughtful teachers. They expose the complexity of the practice of teaching complicated texts, rather than concealing that complexity behind assertions about ‘what works.’ And so the purpose of this book, we might say, is to cultivate curiosity about the teaching and learning of classical Jewish texts, to question and wonder, to help all of us to think about this work with greater depth and creativity…. The study of Jewish texts, we believe, remains hidebound and parochial. Not everywhere, of course; there are many wonderful examples of talented and inspiration teaching…But as a field, for the most part, we do things because (we believe that) this is how they’ve always been done, or because we lack the imagination to do things differently, or because we’re not quite sure why we’re studying these texts to begin with. Images: detail and cover of Turn it and Turn it Again.